Import CDs reship from inside the U.K. Packaging had a U.K. Returns address as well. Import CDs charged 20% vat so there shouldn't be any import fees anyway. Thought I'd confirm anyway. Another one to add to the list at least. Do they add a VAT charge like deep discount? Yes 20% just like DD. I've never minded paying tax or customs fees, it's the couriers 'admin' charges that piss me off. They declared the amount, does that mean that people could start getting hit with import fees? Hmm they still seem to be using Royal Mail and have a UK return address but it’s something to keep an eye on for sure. The amount has always been declared for me. Have yet to be hit with fees, though they do reship via the Netherlands for EU packages. Normally its left blank, I've never received one with the amount on before. I didn't think you could tax second had goods like this? You've not censored your address! 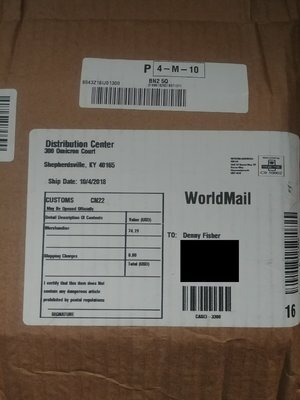 Doesn't second spin usually reship from the UK? Second hand goods are still liable for vat.